Golf course restaurant offers scenic views and fabulous flavors. Try the scratch-made chili and a tuna salad hoagie sandwich with iced tea. This spring and summer you’ll want to spend some time on the patio at Arnie’s in Lake Elmo, Minn. Even if weather doesn’t permit outdoor dining, the scenic views, relaxed atmosphere, range of rotating dishes and specialty cocktails make this full service restaurant and bar a local destination for more than just golfers. The no-fuss lunch and dinner options are updated versions of classic American cuisine. Since opening in August 2017, Arnie’s has been an integral part of the Royal Golf Club. In fact, it may be one of the reasons some diners take up golf, however, you certainly do not have to wear golf pants or know what “par the hole” means to enjoy this exceptional locale. “The atmosphere is family friendly but also very nice for an intimate date night,” Matt Sohlo, chef, says. Arnie’s compliments the surrounding nature and golf course with its terrific views of the first and 10th holes and Horseshoe Lake. The restaurant has two levels and if you’re looking for natural light, the upper level is constructed of mostly large windows so you can experience the view. The vibe is clean, modern and simple with a full bar and an expansive patio for alfresco dining. The patio is open during our warmer months and tables there typically fill up quickly. There is also regular live musical performances so guests get the combined experiences of enjoying the weather, the scenery, the fantastic food and entertainment. “During the summer the patio is full from sun up to sun down with a mix of golfers, families and, of course, former [3M employees and retirees] who wanted to see how their old stomping grounds turned out,” Sohlo says. The entire property once known as Tartan Park belonged to 3M. As styles of doing business changed, the company decided to sell the property but still wanted to leave a legacy, according to Jim Boo, director of sales at High Pointe Realty. The property was sold to developers who continue the vision started over 50 years ago by 3M. Beautiful homes now dot the natural surroundings and the new golf course designed by legends Arnold Palmer and Annika Sorenstam. Palmer and Sorenstam are known as the king and queen of the game, thus the name Royal Golf Club. The restaurant is operated by Bill and Tom Givens whose success is based on providing unique, quality food experiences to local residents such as delivering meals, catering events and feeding hungry golfers. In addition to the main restaurant space and two level patio located in the renovated, original club house, there is a 300 seat banquet room that can be divided into three separate rooms to accommodate 100 guests each as well as a golf shop downstairs. Sohlo describes the overall menu at Arnie’s as being based on comfort foods. The menu is constructed of classic favorites but with small touches to make them even more delicious. Picky eaters and foodies alike will find something they can’t get enough of on the menu. 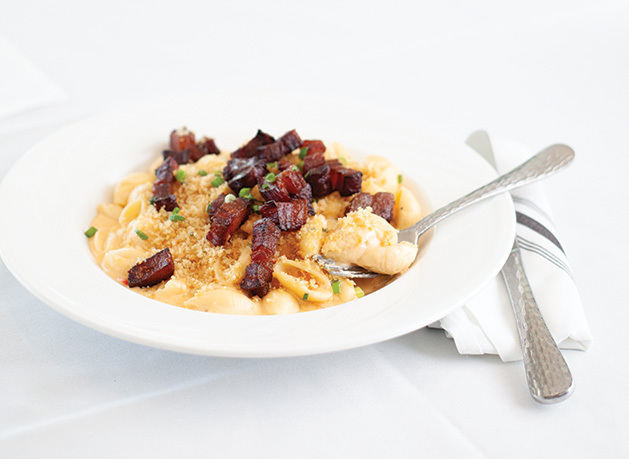 For cheese lovers, try the pimento mac and cheese with candied bacon. 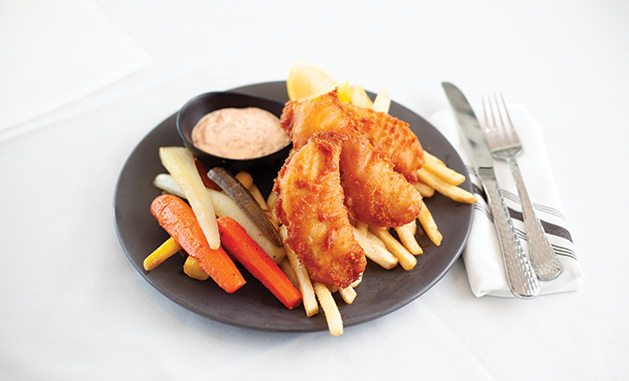 If you’re looking for a fish fry, order the beer battered walleye with red pepper tartar sauce. Even the sandwiches come with updated sides such as sweet potato fries with a marshmallow blue cheese sauce or granny smith apple slaw. Some of the more sophisticated entrees include grilled vanilla butter salmon, butternut squash tortellacci and Gruyere stuffed filet mignon. If you’re more in the mood to snack or want to sample several items, Arnie’s offers a selection of shareables which include favorites such as smoked chicken wings and meatballs. A nod to the Midwest are the Minnesota spring rolls that are a play on the classic spring roll only using Midwestern ingredients such as sausage, pesto, wild rice and cheddar cheese. Arnie’s offers two homemade soups every night, as well as a regularly changing dessert menu with irresistible things like a molten chocolate cake and a gooey butter cake with whipped cream and berries. For those in a rush to get back out on the links, consider ordering Arnie’s Quick Lunch. This includes the choice of two out of three options: soup, a half sandwich and a house or Caesar salad. The sandwich choices include turkey, ham or tuna with several fresh toppings and sauces. The staff at Arnie’s keeps things fresh by allowing the chefs to explore new recipes and encouraging diners to try new flavors. “We offer specials changing monthly that always include a hand cut steak or two. We also run nightly features so that our chefs can continue to be creative on a daily basis,” Sohlo says. Along with being creative with food, the bar works on developing a list of cocktails for each season. The winter offering was a queens apple made from apple cider and fireball. In fall, the mixologists created their own take on a pumpkin drink called a pumpkin Manhattan. We cannot wait to see what’s coming for spring and summer. If you’re as excited as we are, then we’ll surely see you enjoying a sip and a snack on Arnie’s patio or in the restaurant and bar. And if you’re on the links, look up and give us a wave. We’ll raise our glass. 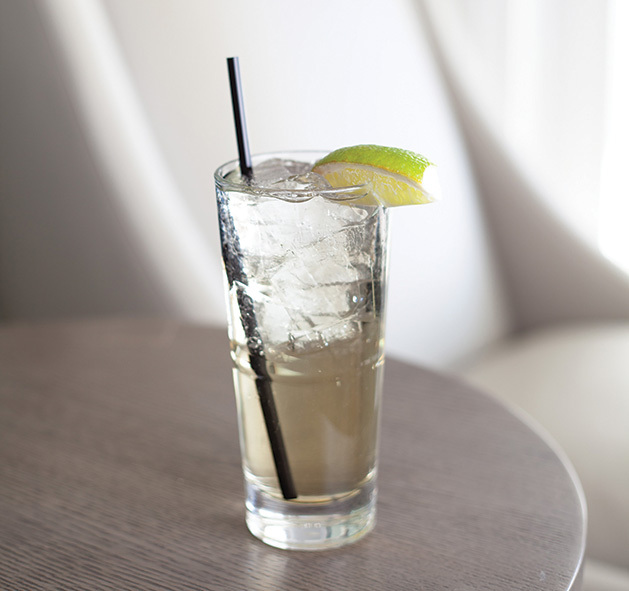 Head to the patio with a fresh and floral cocktail made with tequila, St. Germain, fresh lime juice and a lime garnish. 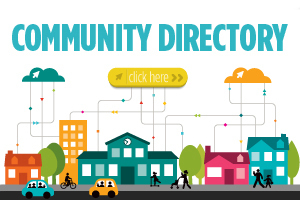 Friday and Saturday 11 a.m.–9 p.m.